[The creativity of] Yorkshire-born, electively Welsh, Onions, a long-time resident of Aberdyfi, is rooted in a… fictional tradition from which he learned the invaluable arts of suggestion, psychological acuity, nuanced characterisation. With him, we move on from the simplistic ghouls and spectral assertions of 1890s genre fiction – a fault… in which [Henry] James and [Arthur] Machen are both culpable – to something entirely more sophisticated. This feature’s second half is Niall Griffiths’ story ‘According to Adrian’, inspired by two of Onions’ stories from The Dead of Night. Griffiths notes the propensity of Onions’ protagonists to ‘insanity… obsessively driven to concretise their hidden daemons, how could it be otherwise?’ ‘According to Adrian’ develops Onions’ themes of ‘materialisation and re-birth’. Adrian, at death’s door after having been tortured by his criminal creditors, fleshes such demons into Haitian gods Baron Samedi and his bride. Boss-man The Arranger and his associates have extracted Adrian’s money and also his teeth, ‘nuggets of ivory in their red liquor’. The Arranger also has the gall to suggest that racism taints Ade’s voodoo-tinted explanation for his perennialbad luck. In this story, traditional victims – Haitian earthquake refugees – trade places with small-time crooks. These newcomers to Britain, within the space of a story told and retold, slough IDs like rattlesnakes. We see our contemporary Baron Samedi and Maman Brigitte morph from Third World disaster escapees into voodoo witches then victims of trafficking, being finally re-born, through The Arranger’s insistence, as survivors who will outlive ‘stupid, pathetic’ Adrian and his ilk. Talking of ‘concretis[ing] daemons’, Issue 98 also features Michael Nath ‘On Atheism and Character’, where he takes Richard Dawkins to task in his reassessment of fiction, faith and atheism, claiming that ‘existence’(including that of God) should be predicated as much on value as material fact: Whoever has been imagined, spoken of, revered, is. Atheists will have less difficulty with this if, for the God of Abraham, they substitute ‘Hamlet’, ‘Jane Eyre’, ‘Natasha Rostov’, ‘Sherlock Holmes’. For the contention that literary character does not exist, or have ‘being’, is hard to support. The characters of Shakespeare may be more vivid (= ‘lifelike’) to us than anyone we actually know…. We attend to characters as to each other, because they seem to have consciousness and souls. Often, we can’t wait to get home so we can see how they are getting on in the book we left on the chair. They are vital illusions. NWR offers a few more such ‘vital illusions’, in Zillah Bethell’s story ‘Obituaries’ and newcomer Maria Styles’ ‘Emmeline’. 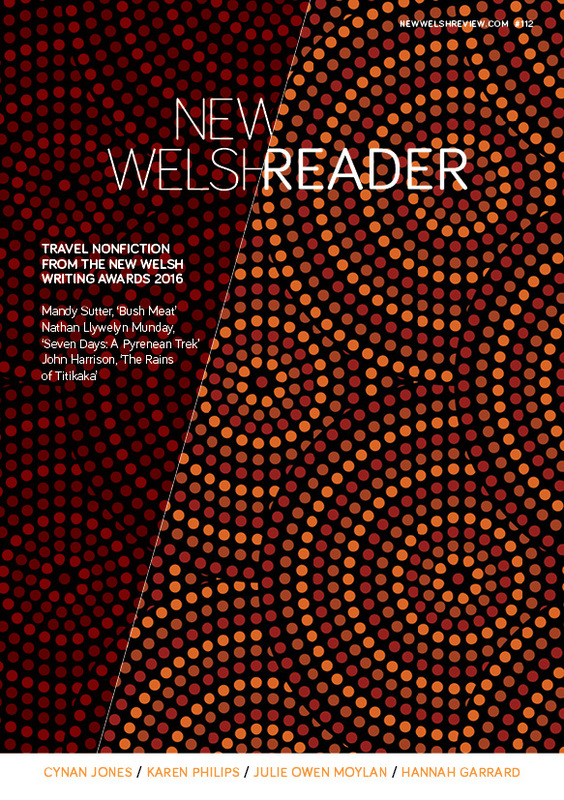 Our reviews cover Ruth Bidgood; Matthew Jarvis on Ruth Bidgood; Tishani Doshi; Kate Roberts translated by Katie Gramich; David Constantine’s stories; Lloyd Jones’ latest for Seren’s Mabinogion series; Kevin Mills’ Libra; a photography title tracing the evolution of the photo-essay since W Eugene Smith’s work in the Valleys; Jay Griffiths’ e-hymn to Frida Kahlo; Matthew Francis’ Singing a Man to Death; Burying the Wren by Deryn Rees-Jones, and Witch by Damian Walford Davies. Elsewhere in NWR 98, flash features by Jay Griffiths and dramatist Alan Harris explore the extremes of performance. In ‘Storms’, Griffiths is almost shaken from her one-night nest in a Strata Florida tree hollow above Dafydd ap Gwilym’s grave; she ponders on the transformative power of the tempest, from Shakespeare through Conrad to Emily Brontë. Harris outlines his Creative Wales Award project encompassing theatre, puppetry, liveart and circus. For some reason, this round’s poetry, selected in conjunction with filter judge Charlotte Penny and poetry submissions editor Tiffany Atkinson, has a distinctly Zen feel. We present: Maitreyabandhu, Jen Coleman,John Kinsella, Christien Gholson, Ruth Bidgood, John White, Jonathan Edwards, DE Oprava and Amy McCauley. Enjoy your ‘vital illusions’!